As a first review of 2015 I just had to start with something good. Somehow and for whatever silly reason it might have been, it seems I have overlooked a small yellow bar in my secret fine chocolate stash. As I was sweeping through my collection today, it caught my eye and there was little doubt on what bar may have the honor of opening a new year of reviews. It’s not a big secret. 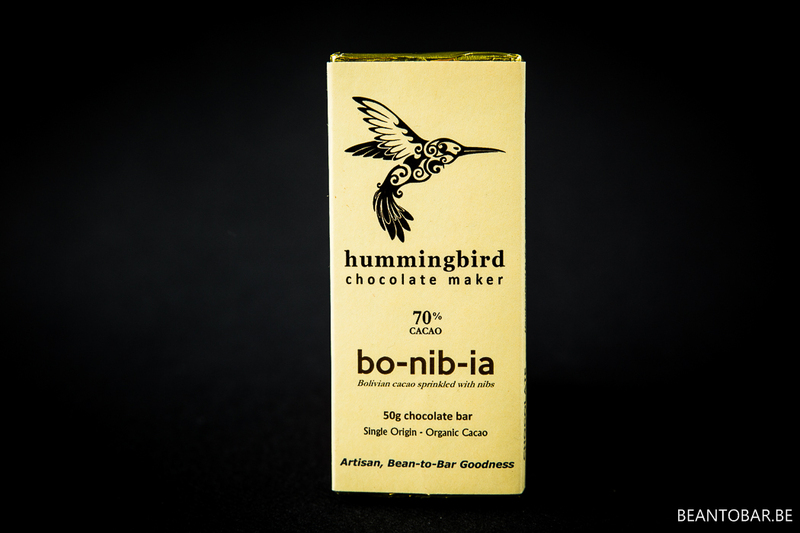 I’m extremely fond of Hummingbird Chocolate from Canada. A Bean-to-bar maker doing his thing on a very small scale, they were honestly shocked and dazzled when they noticed their bars made it all the way to Europe. There is something enticing about their chocolate. But I have to remain unbiased when writing this review. 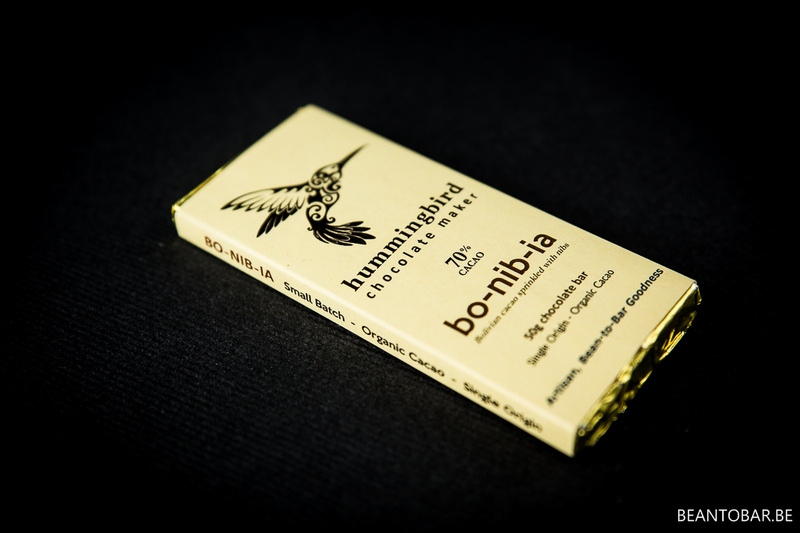 The package features a bright yellow wrapper, decorated with an Inca-style drawing of a hummingbird. 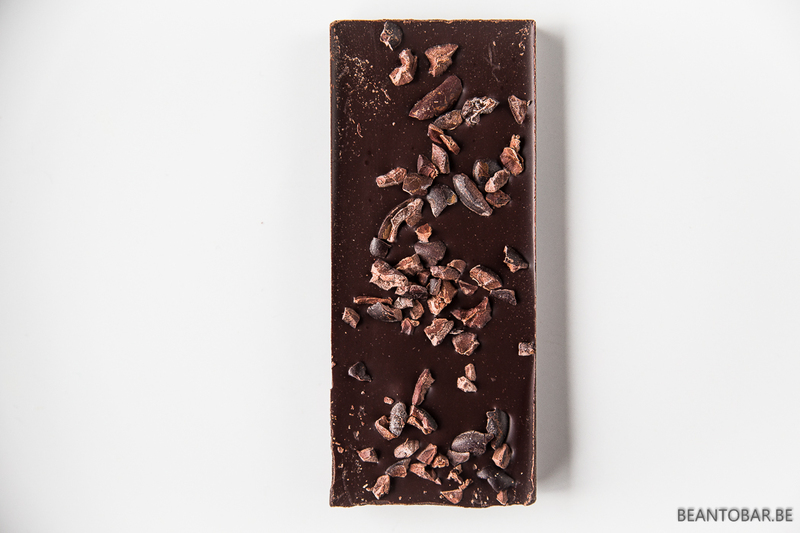 Underneath the cacao percentage – 70%. Next – the playful name of the bar. Bo-nib-ia. Bolivia mixed with nibs. Chocolate an pieces of roasted cocoa. Sounds like a double treat! The chocolate itself is wrapped in a golden foil. Opening it reveals a well known bar design in the world of fine chocolate. Still good looking with different elevations and flower/leaf imprints. The smell of the chocolate is overwhelming and deep. But where most bars shine on the surface, this one hides its secret on the bottom. 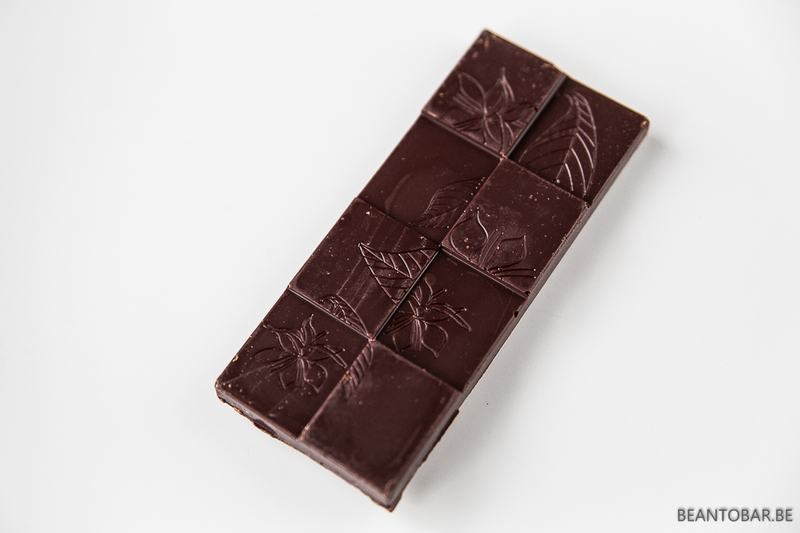 When turning the bar over, the nibs are revealed, sprinkled all over the surface of the bar. The promise of a crunchy bite and more intense flavors! 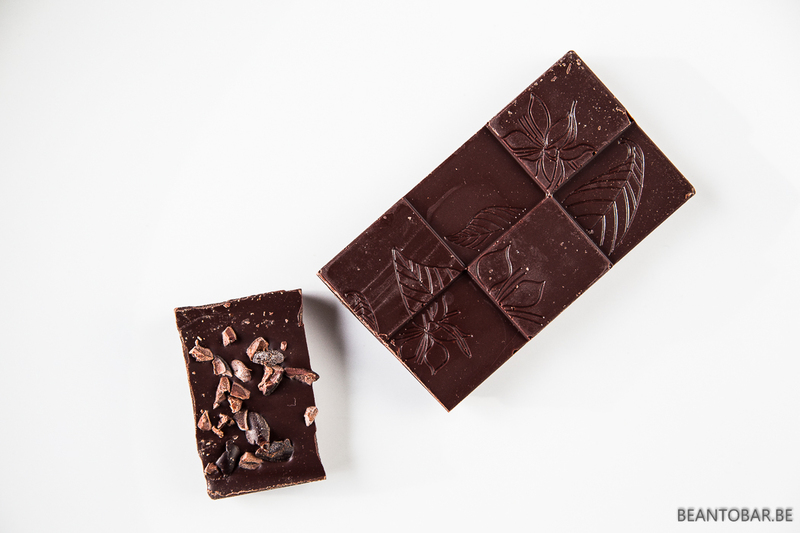 The chocolate origin of Bolivia is little known to me, so I’ll let the flavor come over me without any prejudice. Taste: a deep roasted start – sweet and earthy. The nibs force you to bite down in the chocolate and release powerful roasted nut aromas. Underneath the taste of brown sugar spread slowly,bread, grain and molasses soften the powerful taste of the nibs, adding a sort of spirit-like touch to it. The crunchy nibs are extremely tasteful, releasing bits of true cocoa flavor while bringing forth a nice roasted aroma. The grain/bread aroma underneath gives it a nice complexity, while remaining very approachable – it is very chocolaty in nature. I never like to chew fine chocolate to be able to enjoy all the flavors it brings. But in this case, the delicious nibs just force me to and by doing so, they mingle in their flavors into the chocolate perfectly. The aftertaste is less strong than other bars, but a very nice satisfying deep chocolate flavor keeps caressing your tongue and adds a nice smoky touch. Once more it is hard to put this bar away. You just want another little piece. While tasting the chocolate, the most honest opinion about it was given by my two year old son, who wanted a little piece… seconds after tasting it he demanded more “coco”. And more and more and more! There was just no way of holding him back! They say “truth comes from children’s mouth”. I can’t say I disagree. But how will I explain to him the nice bar of “coco” will be gone in a couple of days? So please people of Hummingbird Chocolate Maker, start exporting to Europe. You’ll make daddy and son really happy!